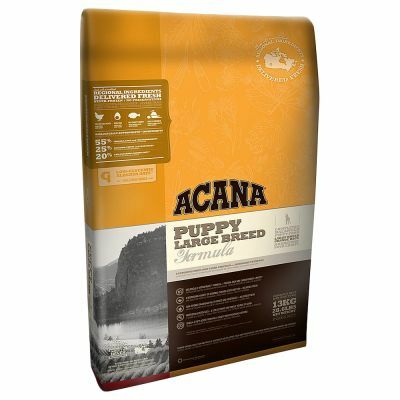 Acana Large Breed Puppy - For Puppies 25 kg and Over at Maturity. The sensitive growth period of large breed puppies requires a diet rich in proteins to support developing muscles yet limited in carbohydrate to manage weight. 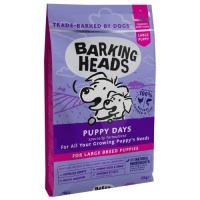 That's why ACANA Puppy Large Breed is loaded with cage-free Cobb chicken and whole eggs from local prairie farms plus wild-caught flounder from Vancouver Island and Okanagan Valley fruits and vegetables - all delivered fresh each day to nourish your puppy completely. Prepared from Canada's best and freshest ingredients, ACANA Large Breed Puppy is a delicious way to keep your puppy healthy happy and strong. Fresh chicken meat (16%); chicken meal (15%); turkey meal (14%); red lentils; whole green peas; fresh chicken giblets (liver; heart; kidney) (6%); herring meal (4%); fresh whole eggs (4%); fresh whole flounder (4%); herring oil (3%); sun-cured alfalfa (2%); field beans (2%); green lentils; whole yellow peas; pea fiber; chicken fat (2%); fresh chicken cartilage (2%); dried brown kelp; fresh whole pumpkin; fresh whole butternut squash; fresh whole parsnips; fresh kale; fresh spinach; fresh mustard greens; fresh turnip greens; fresh whole carrots; fresh red delicious apples; fresh Bartlett pears; freeze-dried chicken liver; freeze-dried turkey liver.